Curry Chicken Salad Wrap is shredded chicken mixed with a curry yogurt, almonds, & golden raisins in a wrap is the perfect lunch! Weight Watchers friendly- 4 SmartPoints! Let’s face it, who has time to make an elaborate lunch during a busy work week. I am always thinking ahead each Sunday and try to make my lunches for the week during my weekly meal prep. 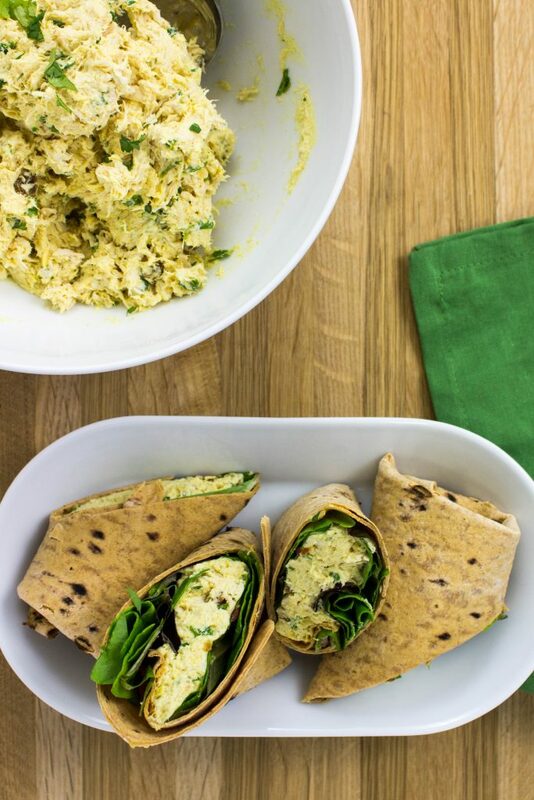 My Curry Chicken Salad Wrap is the perfect make ahead lunch for a busy work week. Perfectly cooked shredded chicken mixed with a curry yogurt sauce, toasted almonds, and golden raisins in a wheat wrap. Delicious healthy lunch! This is a Weight Watchers friendly recipe and one wrap is 4 SmartPoints. Call me a dork, but I totally look forward to doing meal prep on Sundays. It’s a way for me to get myself organized before I start the week. I like to chop any vegetables I know I’ll use during the week, roasted any vegetables for recipes I’ll be making, and cook any meat that I can ahead of time. 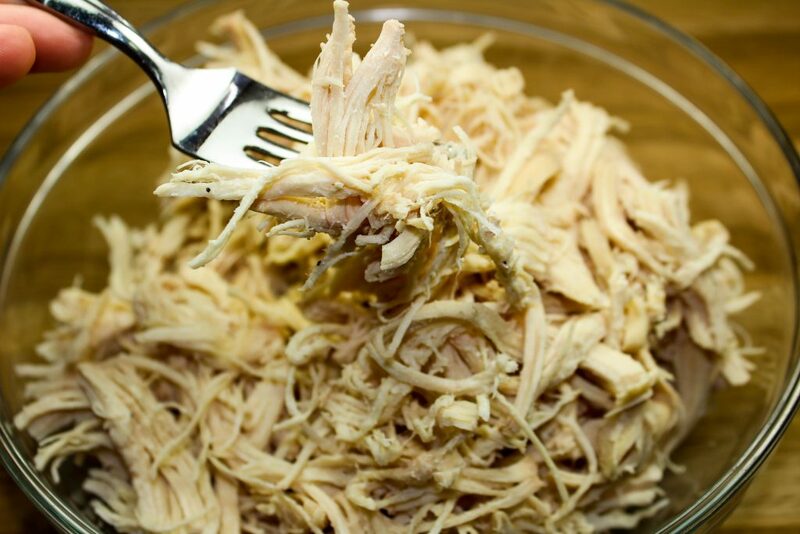 One of my favorite make ahead ways to cook meat is in a slow cooker and my Slow Cooker Shredded Chicken is the best way to make shredded chicken. Shredded Chicken can be used in SO many ways… enchiladas, chicken tacos, on top of pizza, and for chicken salad. I am a huge fan of curry and a while back I was remembering the Buffalo Chicken Salad Wraps I made. I love chicken salad and wanted to make another unique twist on the classic recipe. That’s where the curry comes in. I love curry chicken and knew there had to be a delicious way to turn chicken curry into chicken salad. 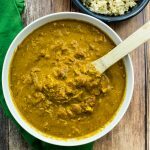 Not only do I love this recipe because it can be made ahead, but it’s super easy to follow… just mix everything in a big bowl and it’s ready to go! After the Slow Cooker Shredded Chicken is made and cooled, add to a large bowl. 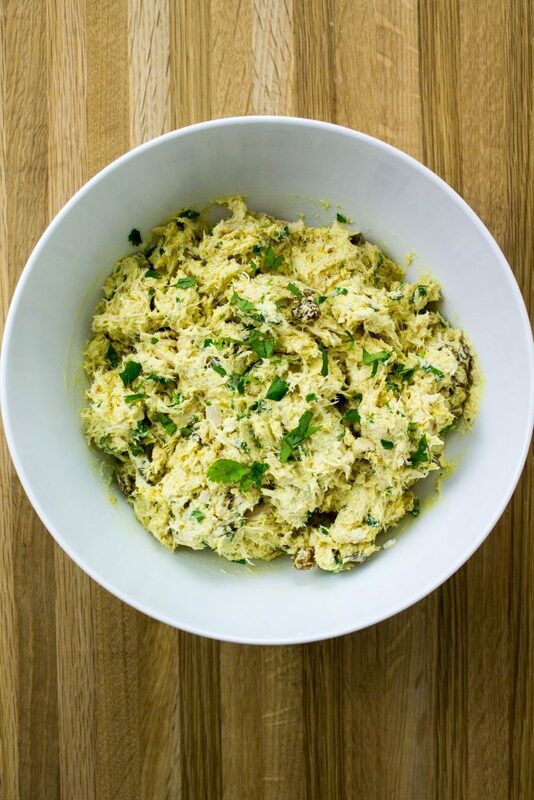 To the bowl, add golden raisins, Greek yogurt, mayo, curry powder, chopped cilantro, roasted almonds, lemon juice, salt and pepper. 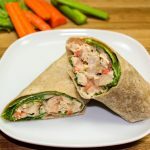 For this recipe is used Flatout Whole Wheat wraps and toasted a wrap for a few minutes (you could omit this step if you are making your lunch in the morning and taking it to work). 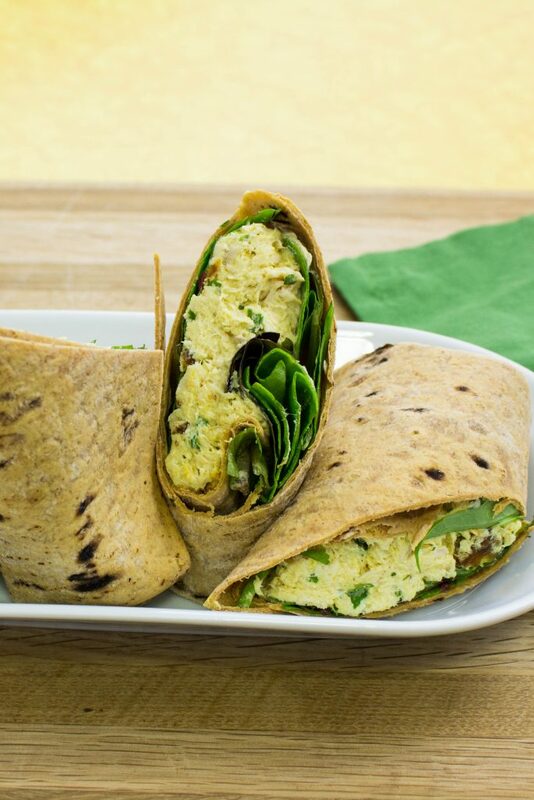 To assemble, just lay the wrap on a flat surface, add some mixed baby greens (or spinach), spoon some of the curry chicken salad, then fold and roll up like a burrito! 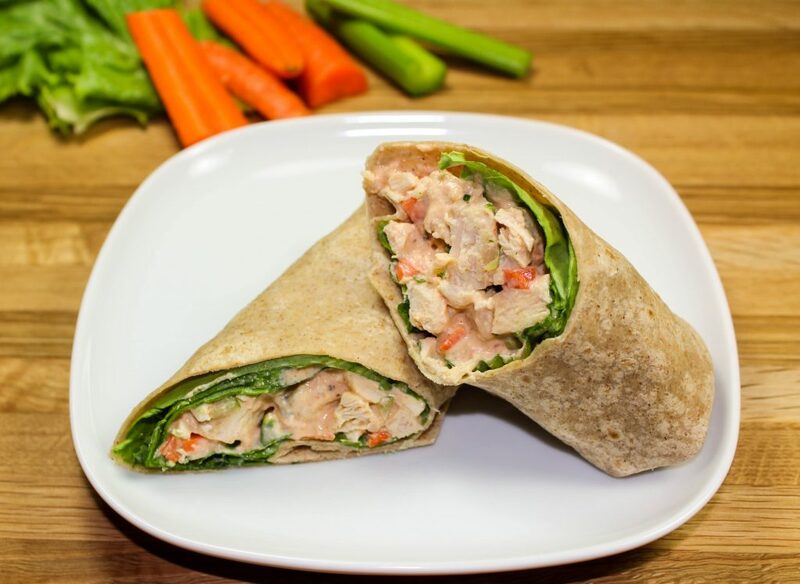 Curry Chicken Salad Wrap is the perfect make ahead lunch for a busy work week. Perfectly cooked shredded chicken mixed with a curry yogurt sauce, toasted almonds, and golden raisins in a wheat wrap. Great for lunch! 4 Weight Watchers SmartPoints for one wrap! Filling and delicious! Cook Slow Cooker Shredded Chicken according to instructions. Once chicken is cool enough to handle, dice and add to a bowl. Toast almonds in a small skillet over medium heat until golden brown. Add to bowl with chicken. 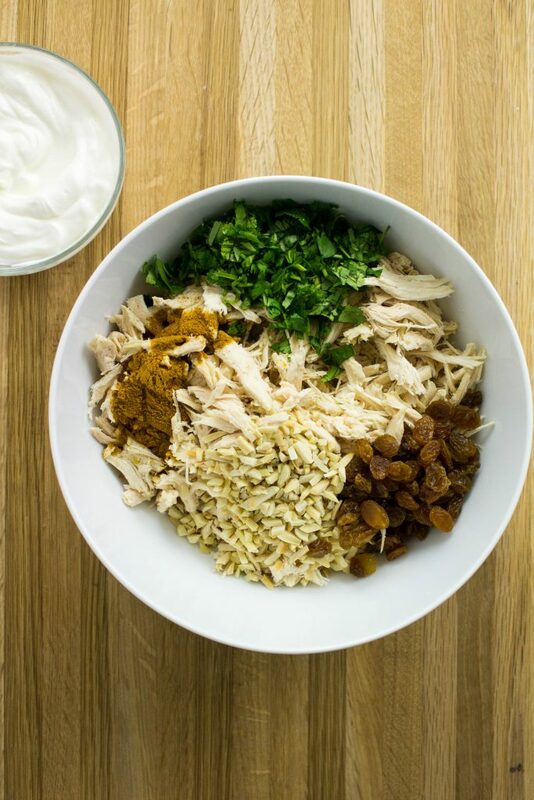 To the bowl with chicken, add Greek yogurt, mayo, lemon juice, and curry powder. Chop cilantro, roughly chop raisins, and add to bowl with chicken. Make shredded chicken ahead of time to save some cooking time! Shredded chicken is freezer friendly! May 4, 2017 at 3:03 pm It's totally easy to make :) Thanks Andrea! 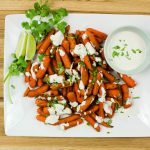 May 4, 2017 at 5:04 pm This looks delicious! May 8, 2017 at 9:40 am Thank you Cheyenne!! 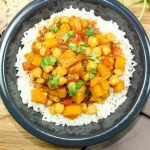 May 4, 2017 at 11:14 pm Love this recipe, it looks yummy! I will be making this soon. May 8, 2017 at 9:40 am Thank you Chelsea! May 6, 2017 at 12:12 pm I am so bored of my lunch routine. I have been looking for new recipes! I'm adding this to the rotation! May 9, 2017 at 8:00 am This sounds really great! I've never had a wrap quite like it, so I can't wait to try it! Lisa recently posted...Chicken Fajita Fried Rice – Happy Cinco de Mayo! May 10, 2017 at 9:00 am You will love it Lisa! !